Come join us for some 4-Kids Fun! This key facilitates the transition from home to school. Children learn practical skills that help them care for themselves and their environment. They are guided in developing respect and appreciation for others and grace and courtesy in social interactions. As children grow and develop, they use their senses to learn about the world around them. Your child will explore color, size, shapes, sound, taste and texture through sight, hearing, touching, smelling and tasting. We provide opportunities for children to express themselves and present activities and materials that help enrich their vocabulary. Story-telling, poetry and language materials stimulate language development, from the spoken to the written word and eventually to reading. Exposure to sign language and foreign language provides additional enrichment. 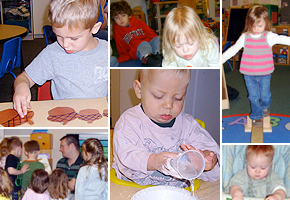 Children are scientists by nature, observing, developing their own theories and testing them. We foster their natural impulses and help them explore and appreciate with their natural sense of wonder. Movement activities are designed to encourage the development of gross motor skills and increase body awareness, as well as to enhance coordination, flexibility, balance and strength. Supporting children's creativity and imagination encourages them to use their own unique ideas, to follow through on them and to decide how to implement them. We help children to recognize the joys of exploring and discovering the outcomes of their creations and to take pride in their work.